Santa Fe, located in the north-central part of the state, is the capital of New Mexico. At an elevation of 7000 feet, it is the highest capital in the country, and the altitude cools its desert temperatures. And with a population of only70,000, it has retained some of its small-town charm. Santa Fe is consistently rated one of the world’s top travel destinations for its combination of scenic desert beauty, history (founded in 1607), cultural diversity, and extraordinary concentration of arts, music and fine dining. In addition to the Santa Fe Opera, Santa Fe offers spiritual gatherings and many spas and resorts. Located 10 minutes’ walk from Santa Fe Plaza, this Santa Fe, New Mexico accommodation features studios and apartments with full kitchens and free Wi-Fi. All suites feature a balcony or patio, cable TV and a fireplace at Casas de Guadalupe. Average score from 25 guest reviews: 8.7/10. My sisters, dad, and I stayed in a hotel last year. This year we wanted a change to be able to relax more. This was the perfect place!!! We loved the location. The accommodations were perfect. We were close to the square and great restaurants, but if we wanted to relax we could enjoy sitting on our own private porch. We will definitely stay here again! The casita was lovely and well-equipped. We were very comfortable there. Location and facilities. Helpfulness of management. The location to downtown was great. It was very easy to walk to the plaza and our restaurant. The casa was roomy for the three of us and quite comfortable. Close to plaza. Fully equiped kitchen with laundry facilities & all the extras.The outdoor private patio is a nice way to enjoy the cool mountain weather. Quiet, charming place. Good size for family with kids. Great location within short walk to the main square in Santa Fe. this place has character, and is close to all the shops. Location, decore, cleanliness This is my second time to stay at CDG. I will come back again in the fall with friends and try a different room. Liked the location and the privacy of a villa, and loved that it had a washer/dryer unit and was well stocked with essentials like laundry soap and paper towels, etc. Just 5 miles from Santa Fe city centre, this motel is 13 minutes’ from Museum of International Folk Art. All guest rooms feature cable TV with extended channels. Santa Fe Ski Area is 10 miles away. Average score from 161 guest reviews: 7.5/10. I loved the vinyl floor! No old carpet to wonder about what's in it and how clean it is. The floor and room was very clean. The beds were good, but they were hard and we prefer a softer sleep, but lots prefer a hard bed so I don't want to discredit the motel for that since that is a matter of preference. The desk clerks were pleasant and accommodating. Very clean and neat. Not too much noise and very comfortable. I was pleasantly surprised by the quality, hospitality,and overall comfort of this motel. 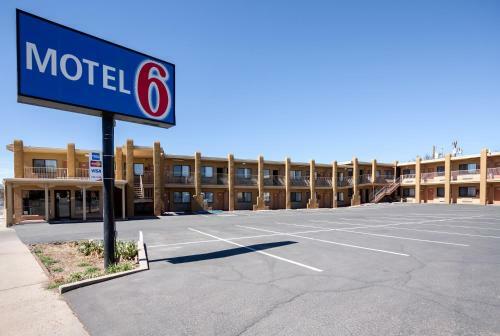 I usually stay at a $100 a night hotels while traveling, but I needed to stay longer due to house remodel-- so i chose to stay at less expensive motel and have now realized that I may have been wasting money on the road--especially if all the Motel 6's are this nice. Clean modern rooms. Staff was friendly and helpful. Location was decent. Hotel was clean and comfortable. Quietness of the room. Nice location. Helpful staff. Location As well, I have stayed at different Motel 6 in the last 2 months and they all have the same upgrades and décor. It makes for an 'at home'. The price is ideal (off season just now). The receptionist (Robin) is so kind and helpful. She gave me some recommendations for a good restaurant. She even called me in the room to make sure everything's fine. The property is renovated and looks very modern. The room was clean with some tiny dirt spots. Located 5 minutes’ walk from the state capitol building, this historic Santa Fe B&B offers a healthy breakfast buffet and free Wi-Fi. The Santa Fe Plaza and Loretto Chapel are 10 minutes’ walk away. Average score from 284 guest reviews: 8.9/10. Old historical property in the hands of the same family for over 45+ years. Property dates back to the 1860's. If your looking for modern this is not the place. Continental breakfast included tamales, green chili stew, fruits, breads and pastries (GOOD). Very friendly and excellent service. Wonderful breakfast! Roomy and comfortable "casita." The Breakfast was a real treat. Soup and Tamales. Walked to the churches and square. I am a watercolor painting and was able to paint three paintings just from the property. Great details on property!! Breakfast excellent great service. FABULOUS breakfast - green chile stew, tamales as well as the "normal" breakfast offerings. The bed was very comfortable, the location was perfect. I could walk to my meetings in the state capitol. The location is pretty much next to perfection. A little walk and you are in the Plaza which was perfect for us after eating a great dinner, a walk helps. The people are very nice and like what they do. The Breakfast were great. That Green Chile Stew was amazing. Great room, very comfortable. Hospitality was fantastic and the location can't be beat. Can't wait to return. Fabulous location. Amazing owners and an incredible breakfast. Historic property, run by same family since the 70's. Beautiful furnishings, attentive service. RTBs: - Indoor Swimming Pool - Day Shuttle to Plaza & Santa Fe Airport - 24/7 Gallery Menu for breakfast, lunch, and dinner with beer and wine served. Landmarks: - Santa Fe Airport, 5 miles - Historic Downtown Santa Fe Plaza, 6. Average score from 199 guest reviews: 8.9/10. Friendly staff, place was clean and the breakfast was wonderful with a variety of food to eat. The room was very roomy and much bigger and nicer than we expected! Will definitely stay here again! Staff was also very friendly. Free breakfast was very good with lots of choices both hot and cold. The breakfast had a nice variety (even for our vegan member of the family). And the room was sophisticated and luxurious to the point that we were talking about moving in. Ability to fit 6 people in a room with plenty of space is a rare find. Stay was comfortable...staff was friendly...price was excellent! facility and room were clean & comforting. Low noise level. 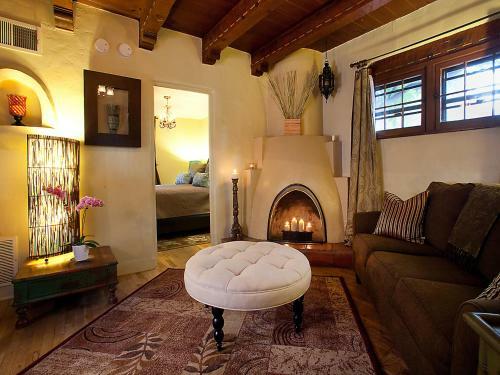 Featuring authentic southwest décor, this Santa Fe area bed and breakfast includes guest rooms with free WiFi. Parking is provided. A free breakfast is served daily. Average score from 10 guest reviews: 0.0/10. See all hotels in Santa Fe. Within walking distance to many of Santa Fe's main attractions, this condominium-style property offers spacious accommodations, thoughtful amenities and many of the comforts of home. Average score from 248 guest reviews: 9.2/10. The resort and staff was amazing ! Our room was just like being at home away from home. Location of the property, and the cleanliness and comfort of the room. I would definitely recommend. We liked that the kitchen was stocked, the bed was comfortable, they let us have early admission because it was available. Parked right outside the door. The rooms were lovely. The people were friendly. Two tvs - great suite. Very excellent Suit Accommodations, for a very reasonable price. Walking distance to the Santa Fe Plaza. Great hot tub & access to a BBQ for an 'at home' feeling! 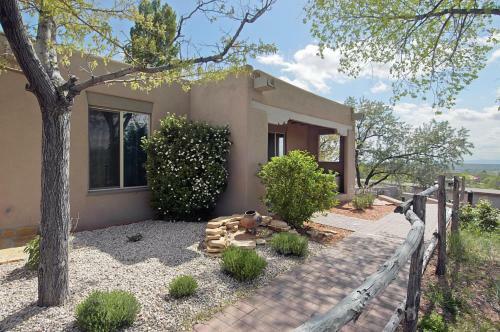 It was an ideal location;near Santa Fe's prime destinations but tucked away in a quiet local neighborhood. 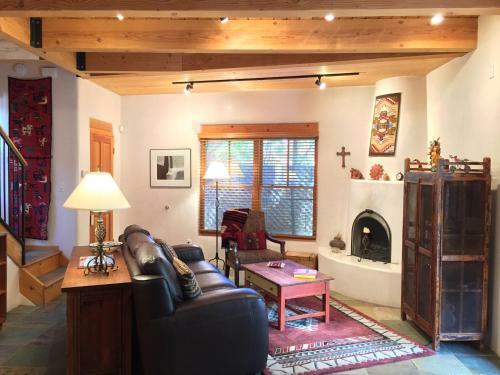 Fantastic location walking distance to historic, downtown Santa Fe. Beautiful facility, well kept, clean, safe, inviting with all the amenities a traveler might want. Really like how clean the resort was; the location is nice and quiet; staff was really friendly and the lobby was very cozy and welcoming with a cozy sitting area (with free coffee), a gym, pool table, reading room on the side, and washing machines free of use all in the same building. The rooms were extremely clean with a nice little balcony to enjoy the view. Overall a very nice stay, can't top the experience with the same price! Would love to come back and stay at Diamond Resort again! Great location (easy walk to the downtown area), great staff, and the room had everything we needed, including a sofa sleeper in the livingroom. Well stocked kitchenette, and comfortable beds. It's in a really good location, like 4 minutes driving from downtown, it's really comfortable like a little apartment. Friendly Staff, Good Parking. First place I have EVER stayed where there were 2 TV's. GREAT! This place was like a great apartment instead of a hotel room. Lots of closet space. As good as being home! BOOK THIS HOTEL NOWSee all hotels in Santa Fe. 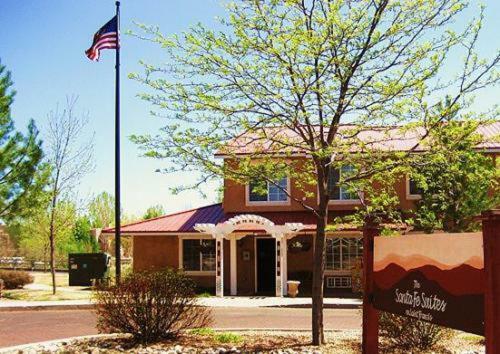 Located near the Gallery District and Santa Fe Plaza, Econo Lodge Inn & Suites hotel offers the suitable location for enjoying and exploring the area. Average score from 325 guest reviews: 8.7/10. Cheese omelet prepared on the spot. Very good- additional ingredients would have been an added extra. We have been return visitors to area for many years and when staying over in Santa Fe always try to stay at this property. Motel is conveniently located between Interstate and Plaza and Downtown is only a short drive away. Not far from maddening crowds, especially on weekends. Rooms are well furnished and clean; far better than most budget motels care to offer. Staff are pleasant and helpful. Morning buffet looks and smells wonderful and they now have a manned omelette station. We have always gone out for our Northern New Mexico cuisine breakfast fix so can only say Coffee is excellent😀 We highly recommend this property. Staff was very helpful. Bed and room was comfortable. Bed was great and the breakfast was very good. I would stay hera again. Sarah was very helpful. She is an excellent employee so was everyone else. Sarah at the front desk had a very friendly personality as well as helpful. Next day after we left, touring the city, we needed an address. Called the hotel and they looked up address. That is service! This is just a standard, bare-bones motel but it offers a superior experience. The staff is attentive and helpful; the facility itself is spotless; our room was inviting and the bed was extremely comfortable. It's got to be the best value in Santa Fe! 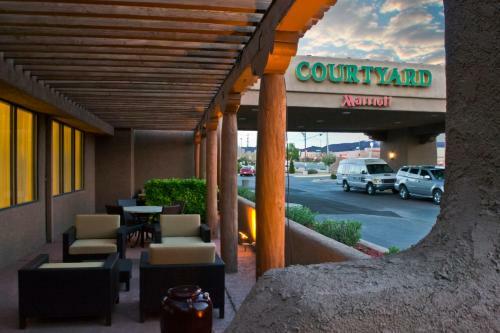 The Comfort Suites hotel is near College of Santa Fe and the Museum of New Mexico. The Eight Northern Pueblos Arts & Crafts Show, Santa Fe Opera and Ski Santa Fe are all located minutes from the hotel. Average score from 160 guest reviews: 8.6/10. The room was very clean and the bed was comfortable. The time there was quiet and peaceful. Everyone there were friendly and helpful. We enjoyed the location. Easy access to the places we visited. The room was comfortable and comfy. I will stay again. Liked the pool and spa!! We had just spent several days in a five-star resort and were surprised that many of the amenities we enjoyed there were present at Comfort Suites. The accommodations were clean, the hotel was quiet and the breakfast was good. I thought the location of the hotel was excellent--lots of restaurants and stores around it for things that I needed to get. Very comfortable bed. It was very clean, enough towels. Didn't have the breakfast . The room was close to everything but the noise level was low which made it perfect. Breakfast had a nice variety everyday. The front desk people were over the top helpful. Hoskeeping did a wonderful job and were friendly in the hallway. The hotel was wonderful! The staff was very pleasant. The staff were friendly & helpful. The room was wonderful... comfortable & clean. The room was clean and quiet. The staff was friendly and helpful. The breakfast has enough variety that you're able to enjoy different food every morning. Newer facility. Very clean. Comfortable bed. Nice TV with Direct TV cable that has an TV GUIDE (remote control). Breakfast was the best we have seen (except Embassy Suites). Nice bathroom and shower. For $99 it is likely the best deal in Santa Fe. 24/7 coffee that actually tastes good too! This hotel, just 2.7 miles from the Santa Fe Country Club, offers warmly decorated rooms with cable TV and a work desk. It also features an indoor pool and free Wi-Fi. Average score from 213 guest reviews: 8.5/10. The bed was very comfortable, there was also a sofa bed that was comfortable. The size of the room was good , the staff is friendly it's in a good location even though it's a bit far from the downtown area, but so far it is the best hotel I've ever stayed at in Santa Fe. The front desk and the house keeping !! Everything so clean and everyone so friendly !!! 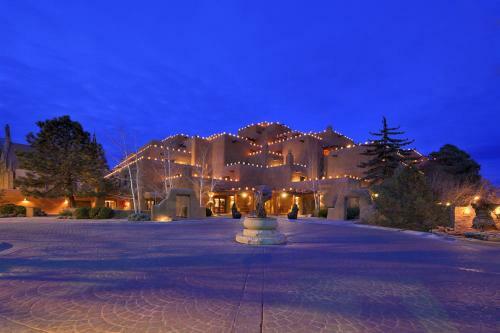 The location close to Taos and perfect for skiing in Santa Fe and Taos !! I rebooked in March and will be happy to contribute to a survey after my March stay. Hotel staff was very friendly and helpful. Clean rooms with comfortable beds. Location was in a nice area that we felt safe & close to a restaurant that stayed open late. Breakfast offered many selections and was quite good. Ease of location, friendly staff, clean & comfortable rooms. Everything met or exceeded our expectations. Good room, satisfactory breakfast and afternoon snacks were most welcome. 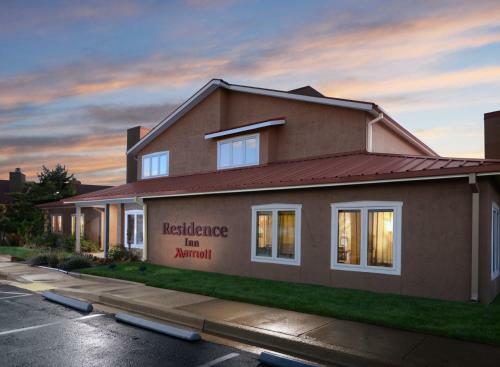 Located 15 minutes’ drive from Santa Fe County Municipal Airport, this hotel features an indoor heated pool and hot tub. It serves a daily continental breakfast. Free Wi-Fi is offered in all of the spacious rooms. Average score from 671 guest reviews: 8.4/10. wonderful breakfast; good bed; exceedingly friendly and helpful staff. Breakfast was excellent. Room comfortable and clean. Welcomed our pet unlike other hotels that seem to assume you have lower standards because you are travelling with a pet. Didn't even charge extra for pet. Other hotels charges you extra to give you a room that is poorly taken care of BECAUSE you have a dog. This hotel went above the norm. At booking .com you should list more hotels like this one. The next night we stayed in a dive. The staff went above and beyond to accomodate me. They showed extraordinary kindness and compassion towards me when I was faced with a stressful dilemma. Great breakfast, very nice staff. Lovely decor. Liked having a table instead of a desk. Decent location, friendly, helpful staff, nice ambience, loved the pool and hot tub, good variety for breakfast. Everyone was very helpful and friendly. Any problems we had were addressed in a efficient and timely manner. I loved the indoor pool and spa. It was a nice break from the cold to swim and relax. Really nice location, close to shops and restaurants, right on one of the Main Street of Santa Fe. Decent breakfast with eexcellent hours for the indoor pool and jacuzzi. Clean, room in great condition, ammenities were appreciated (pool/spa). Pet freindly. 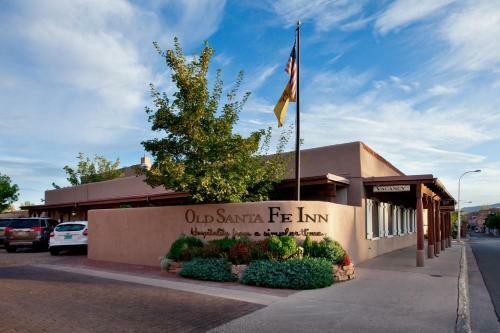 Located just 6 blocks from the Historic Plaza across from the Santa Fe Railyard Park, this Santa Fe hotel offers free shuttle service to local attractions. Free Wi-Fi and a continental breakfast are also provided. Average score from 32 guest reviews: 8.2/10. Authentic cozy nice people good food the shuttle downtown! Location to the Plaza and the shuttle. Happy Hour. The staff. Comfortable bed. Heater was quiet, nice shampoo and conditioner. Food was great. Room was a bit tight with 2 double beds. The rooms were very clean. Beds were comfortable. Staff was very friendly and helpful! They just remodeled the hotel and was very nicely done. We chose this hotel because of its proximity to downtown Santa Fe and easy access to skiing. We were not disappointed. The property is older but it's well kept and has a bit of a campus feel; the staff was friendly and helpful. The lobby is nicely decorated and there is a breakfast area and a bar area that had live music one evening. To our delight, they have a shuttle that goes hourly to the plaza, which saves the hassle of trying to find parking. Next door is a Whole Foods store and also within walking distance is a Star Bucks and a lovely New Mexican restaurant called La Choza that we loved. The price point is very good and we would definitely stay here again. The room was a little tight on space for two queen beds but acceptable and a great value. The breakfast area was beautiful! They had a restaurant/bar connected to it, which was inviting. The staff was friendly and helped my husband and I with every question we had. Not only that, but the reception area, and the bedrooms were spotless, beautiful, and just amazing. I will DEFINITELY be booking here every time I visit Santa Fe. Fabulous breakfast! Ease of in-and-out with luggage! Very pleasant and helpful staff! Great value for the money! 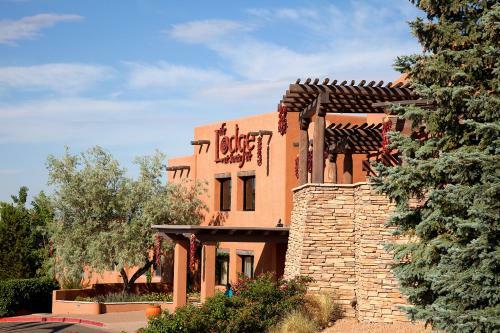 Just 5 miles away from the Santa Fe Airport, this hotel offers guest rooms with free Wi-Fi. A restaurant is located on site. An indoor heated saltwater swimming pool is provided for guest relaxation. Average score from 70 guest reviews: 8.2/10. Very clean and good location ( close to downtown) and clean /comfortable bed! Quick check-in. Clean/Quiet room. Great location. The bedding and pillows were comfortable. The staff was very Friendly and helpful! Room was nice and clean. liked most? convenient location to santa fe sites/events, staff on saturday was super helpful. offered a free shuttle to downtown and to pick us up at same. shuttle not available, so they sent a cab to pick us up for free! after a night of drinking, it was too risky to drive home 55 miles away, so we booked here hoping to avoid the trouble. this was absolutely perfect for that. will do such overnight trips more often and this will be the place. clean, quiet, oh so quiet, and convenient. loved it. and lots of food and regular shopping right next to property for all your needs. Liked having an in house bistro. We had a long day of driving and it was nice not to have to get into the car again and travel to a place to eat and have a glass of wine or beer. The hot breakfast choices were excellent. Great staff and facility. Great suggestions for restaurants. The beds were nice and soft and comfortable amount of pillows. Baymont Inn & Suites Santa Fe offers accommodation in Santa Fe. The rooms are equipped with a flat-screen TV with cable channels. Every room is fitted with a private bathroom. The nearest airport is Albuquerque Sunport Airport, 94. Average score from 155 guest reviews: 8.0/10. Breakfast was excellent. Staff let me borrow phone charger and gave me an extra one since I lost mine. So reassuring. Staff was very informative as well. Thanks to Steven, a super night clerk! i loved the back entrance to our room and the variety for breakfast! also the big bathroom! The manager was the most friendly guy ever. He gave us a coupon to use in a nearby restaurant. Breakfast was great! Extra items. The management was excellent, and the service was very pleasant. This was such a wonderful, warm and inviting place to stay. I spent the week by myself and the staff (family) that ran this Inn were incredible. They were helpful with tourist suggestions and the breakfast was very good. Also , coffee available all day. Well worth the money and would definately stay there again. I was really impressed. It was reasonably priced and very nice. Bed was comfortable, nice and clean. Breakfast was good . Everything! The employees who assisted us, Ashish and Dimple, were both super helpful and friendly! The staff were very helpful, places to see, places to eat, etc. Nestled in the foothills of the Sangre de Cristo Mountains, only minutes from downtown Santa Fe, New Mexico, this all-suite hotel offers a free, continental breakfast. The Santa Fe Suites features suites with full kitchens. Average score from 552 guest reviews: 7.8/10. Clean, comfortable, small apartment feel. Not luxury, but an excellent value for the price. Management was great in letting me shorten my stay even though I booked for longer. This was a very good value for the low price that we had to pay. Definitely not a five-star hotel, but definitely a very good bargain. I will certainly use it in the future! It was a great deal. Easy access from I25 and easy to get down town. Great staff and very comfortable!! Good value for $$. Traveled with pets- very accommodating. The suite was very cosy, with a kitchenette, that had basic stuff and coffee maker. I liked the kitchen table with high chairs. It was a very comfortable and clean room. Only about 10 minutes from the Old Town Plaza. The location was great. It is located beside a shopping strip. I was able to walk to Subway, Double Dragon Chinese Food, get a manicure and shop at Albertsons. Public transportation was located on the other side of Albertsons. My room had a full kitchen with dishes, plates, pot and pans. Great amenities, clean rooms, great central location. America’s Best Value Inn Lamplighter, less than one mile from the College of Santa Fe, features an indoor pool and hot tub. Rooms offer cable TV with HBO film channels and free WiFi. Guest rooms provide seating areas and refrigerators. Average score from 536 guest reviews: 7.7/10. Bed was so comfy, I left my retreat setting which was uncomfy and stayed at Lamplighter as 1) bed was wonderful 2) owner was fun, kind, accomodating 3) hot tub was Great! 4)attractive and easy setting that is convenient and quiet!! The place is old but being updated. New carpet, toilet and beds. The pillows are fantastic. Super clean. Has a fridge and coffee maker. Free parking onsite. We could get into town by bus. The water was hot, bed comfy. Staff pleasant. Owner is always kind and bed super comfortable. Hot spa is nice after a 12 hour drive. Convenient location . room and pool were exactly like the photos. Very clean, quiet. Ping pong table created an unexpected fun interactive moment with my kids. It was easy to find and accessible to everywhere we were going. It was quiet despite lots of people, including children, about using the pool. Staff were super friendly, the room was clean and the bed was comfortable. All in all a great experience. Room was clean and hotel had an indoor pool. Hotel was easy to find. Best hot tub and pool experience ever for the price. This Motel 6 is ideally located within a 15-minute walk of the historic Santa Fe Plaza and Georgia O'Keeffe Museum. It features a business centre and free Wi-Fi. Average score from 189 guest reviews: 7.6/10. Perfect location for downtown. Great bed! Lots of space. Great shower. The bed was a bit hard. The room smelled like cigarette smoke. Excellent location. You can walk 4 blocks and be in the Santa Fe plaza, without needing to find a parking place! Especially enjoyed the refrigerator so that I could store food overnight purchased at grocery store earlier. Clean. Large, comfortable bed. Refrigerator was a great bonus. TV was decent and the shower had great pressure and temp control too. Proximity to city center. Simple but modern rooms. Good wifi and good price for size of room. Great location at a low price. Walking distance to all major sights. Room had everything I needed. This motel is clean, comfortable and in an excellent location. it's a short walk to the city centre, the Railyard precinct and Whole Foods. Railyard has a Saturday Farmer's Market, a cinema, and two excellent brewbars; Boxcar & 2nd Ave. Whole Foods is a great place to grab an inexpensive breakfast. (It also has a brewbar....) Our receptionist, Stephanie, was just fabulous. 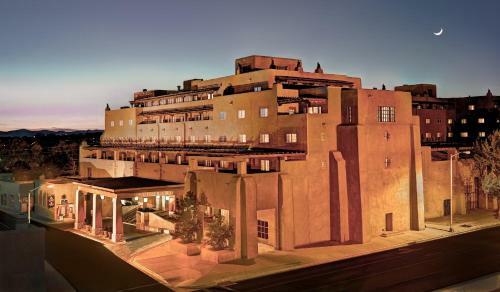 On a hill overlooking Santa Fe, New Mexico, this hotel offers a shuttle service (upon request) to historic Santa Fe Plaza. It features an outdoor pool/hot tub, on-site dining, and free in-room Wi-Fi. Average score from 180 guest reviews: 7.6/10. The bed and room were so comfortable! I didn't like the first room I was given but when I spoke to the front desk, they were really nice and accommodating and gave me a room I was very happy with. Great service. Bed was very comfortable. Linens and towels changed every day. Housekeeping was very through. On site restaurant had great breakfast. There was also a free shuttle service to take you anywhere you wanted to go. Super comfy king bed in Kiva Suite ! Huge suite ! very comfortable bed. nice landscaping around property-- wall and plants blocking parking lot view. hotel on a hill-- beautiful views from restaurant! Room nicely decorated in a Southwest theme. Great breakfast and breakfast room. Free shuttle to take us to downtown Santa Fe. Great view from breakfast room on top of a hill. Property is a little worn, but comfortable, great location and friendly staff. Especially liked the free shuttle service. Great value. A little off the beaten path, but shuttle was very convenient and appreciated the openness of the location. The room and bed were both very comfortable. The breakfast choices were fine and it was very pleasing to have real utensils to eat with rather than disposable cutlery. The concierge, Monique, on duty at the desk on the day we left was a model of charm and professionalism. She organised transport into the city and back to the hotel for us which was greatly appreciated. The room was very nice and the bedding and furniture including the bathroom was very nice and clean. Located 6 miles away from the New Mexico State Capitol, this hotel features an outdoor swimming pool. It serves a daily continental breakfast. All guest rooms offer free Wi-Fi. Average score from 367 guest reviews: 7.4/10. Cleanliness good, staff was congenial, Continental Breakfast was good. Size of room and that you entered from inside the building rather than an outside door. Loved the set up of the room for working. It was very comfortable. It was a regular la Quinta just like exprected. Nothing more and I'm okay with it for the proce. The rooms were clean, beds comfortable, and the staff was very friendly. The overall eating area and food were unappealing . We had left over food which they put in their frig for us since there is not one in the room. Then there was a microwave which we used to heat up the food. The bed and pillows were very comfortable. The room was clean, it was large enough and had all of the Amenities I needed. The room was clean and comfortable. The staff was friendly and very quick. Excellent customer service!! This hotel in Santa Fe offers free Wi-Fi, a deluxe continental breakfast with hot waffles and a gym. The downtown Plaza and St Francis Cathedral are a 15-minute drive away. Average score from 684 guest reviews: 7.1/10. Rooms were clean and updated. Plus a free breakfast is always good. Oscar provided great customer service as he checked us into this Super 8. The first room he assigned us was in a wing that is being upgraded. The room smelled like someone had been smoking in it so I asked for another room. He moved us to the wing that has been upgraded and it was nice. It even had a refrigerator which pleased me. The breakfast was good and even included biscuits and gravy. An attendant constantly added items as they were needed. There was a baggage cart which we were able to use that helped us get our things from our room much easier. The breakfast. The staff!!! Recommended an excellent mexican restaurant to us. Very informative and enjoyable. Went the extra mile. The staff was friendly and was willing to address any of our issues. Did not eat, met a friend who lives in Santa Fe for breakfast. Best value for the money! Nice decor, spacious lobby, clean room, fresh sheet, and it was the cheapest room during my trip. Excellent staff,easy access to parking and exits to Main roads. A good place to stay like an old Hotell Comfort for me includes room temperature, blanket not comforter, updated bath facilities, and cleanliness. Breakfast was the usual help yourself. This place is older, but is updated in right places. Your excellent staff - especially the very cheerful, helpful man who provided us with breakfast!! Beds were comfortable, rooms were clean. A very nice place to stay for a very good price. Situated 10 minutes outside of downtown Santa Fe and less than 20 minutes from the Camel Rock Casino, this hotel offers an on-site restaurant, outdoor pool, and free in-room Wi-Fi. Average score from 186 guest reviews: 7.0/10. Good stay for an overnight while on a road trip Staff was friendly and helpful. Your breakfast was very good and our room was in a good location. Easy to find from I-25N. Ample parking for truck pulling trailer. Comfortable room. Retaurant on site. Efficient staff. Good breakfast. Very clean, comfortable, quiet, great beds and fabulous breakfast. Nice breakfast, fruit very nice, nice to have Cranberry juice. Rolls nice, enjoyed sauage. WiFi worked great! Thanks for having 3 chairs in the room, we used table & chairs to play a couple games of dominos. Room was clean and comfortable. Only there for one evening and night but we did rest well and felt secure. This hotel offers a seasonal outdoor pool and rooms with refrigerators. The property has easy access to Highway 14 and is within a 10-minute drive of downtown Santa Fe, the state capital of New Mexico. Average score from 370 guest reviews: 6.8/10. Nice location. Second room given was good, clean and felt secure. Was very happy. Good breakfast relatively to other places used. Breakfast room had adequate seating. Would have liked to have bananas available. The breakfast was pretty good. They had a variety of items. We were given a court yard room facing the pool (closed) however it was very quiet. The room had all the extras we needed fridge, hairdryer, ironing board etc... Very full assortment at breakfast with hot food being topped up when needed. I requested an extra blankets & it was no trouble- it was delivered in 10 mins We ended up exploring the area longer than we thought- so booked another night. The location is right next to my best friend's home. We needed an overnight stay at a great price As we passed through... Days Inn delivered for the price. Bonus: The king room had a pullout for the kids, so mom and dad got a bed to ourselves. Staff, especially Jim Hawthorne, are so hospitable..Rooms are nice..Pillows are great..Our 2nd time to stay there this year. I liked the location, price, and being pet friendly. Serving a traditional breakfast with local cuisine, this historic bed and breakfast features accommodations in 3 separate buildings. It features free WiFi and is 5 minutes’ walk to the Plaza. A wine and cheese hour is offered nightly. Average score from 123 guest reviews: 9.5/10. The Inn was very comfortable, there was coffee available early and snacks in the foyer. It was in easy walking distance to restaurants, shops, and museums. Each morning 's breakfast was delicious...homemade...staff were helpful in recommending places to dine in Santa Fe....plus they were wonderful people! We'll go back! The breakfasts were hearty, healthy and delicious and in such a cozy dining room with a wood-burning fire each morning. The staff was very kind and helpful and our room was nice and cozy. Hacienda Nicholas is in such a great location and it is easy to walk to most attractions and delicious restaurants. Close to many attractions, easy to walk. Breakfast and happy hour were nice, room and bathroom were well laid out and comfortable. Lovely property and friendly people. Breakfast was amazing every morning and staff was so friendly and nurturing, we felt like we were staying with family. Big comfortable room. Home cooked breakfasts were wonderful. The hot breakfast served in the beautiful shaded patio surrounded by flowers was perfect. The owners are so friendly and attentive, everyone feels like a friend as well as a guest. 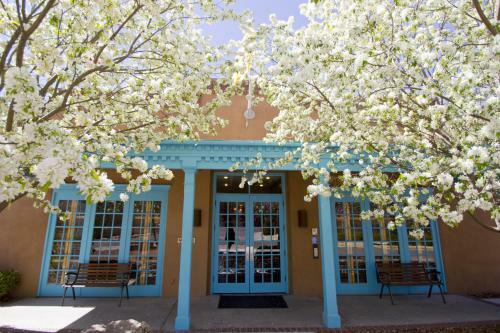 The inn is charming and within walking distance of Santa Fe attractions. Room was very comfortable and food great for breakfast. Loved the setting and the comfort and people were very friendly. Enjoyed the stay. Thanks for the map and info very helpful. Thanks!! The breakfast was amazing and the location is within walking distance of the plaza so no worries about parking. Our room was very comfortable and clean. Just delightful! We just stayed overnight but we loved it and hope to stay longer next time. The staff was friendly and accommodating. The bed was so comfortable. Breakfast was delicious. 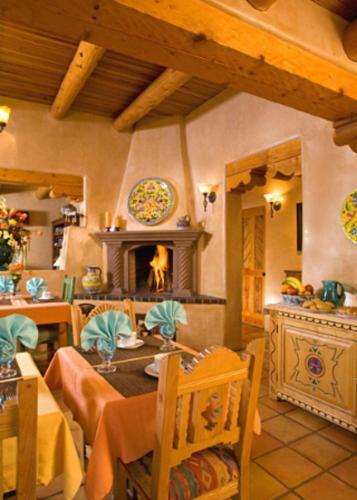 Featuring Southwestern décor, this hotel is located in Santa Fe. All rooms are equipped with free WiFi. A daily free full breakfast is provided to guests. Georgia O'Keefe Museum is less than 10 minutes’ walk from the hotel. Average score from 271 guest reviews: 9.2/10. Great location to the plaza, all the shopping and restaurants. Not a bad walk to Canyon Road. Staff was very helpful and pleasant. Beautifully decorated rooms. Very comfortable and inviting. Definitely would rebook this property. Close walking distance to shops and museums. Great coffee and breakfast. we really enjoyed the location, easy to get to the shops and food in old town. once we got to the inn we could walk to all the cool places we wanted to go. breakfast was very good. The bed was comfortable, breakfast was good and we were within walking distance of so many places. The room was compact in size but never felt crowded. Very nicely decorated. We absolutely loved our stay at the Old Santa Fe Inn! We booked last minute when our plans changed for weather reasons, and were utterly charmed by the delay. The hotel is full of endearing details---the tile map of the Sante Fe trail, the old phone booth in the lobby, the lanterns and peppers---it's truly quaint. The breakfast room is lovely and feels more like a pleasant cafe, and the food was good. The location can't be beat either, you can walk anywhere you need, and the staff are helpful with suggestions and maps. We plan to return! Very nice range of choices for breakfast, including breakfast burritos, waffles, cereal, toast & cream cheese. Great location close to central plaza and free shuttle route. Rooms are quiet, with microwave and mini fridge. Tea & cookies each afternoon were a nice touch. Comfortable rooms, well decorated. Wonderful breakfast. Loved the array of Starbucks coffees and delicious teas, fresh fruit and the burrito bar were a hit with my sister and I! Location was perfect! The hotel was great and the location was great! Breakfast burritos were great! All around great family vacation place! Near Santa Fe's historic Plaza, home to shops, restaurants and attractions such as the Loretto Chapel, this property offers accommodations with all the comforts of home. Las Palomas serves a free deluxe continental breakfast every morning. Average score from 538 guest reviews: 9.2/10. Accommodations were excellent, as was the staff. Awesome breakfast...take time to enjoy the variety provided. Walking distance to shopping, restaurants and entertainment. We liked the comfortable feel of the room. Especially we enjoyed the breakfast which gave us an opportunity to meet international travelers. The location was quiet. Amazing staff! Excellent complementary cookies and varieties of coffee! Included breakfast is off the hook! Love, love, love Las Palomas! By far my favorite hotel I've ever stayed at! Breakfasts were excellent. Old Adobe room was a rest to stay in. We loved the fireplace in the room. Breakfast was excellent! Everyone was friendly. It is a wonderful surprise for us and everything has been outstanding! The location is perfect for walking into town easily, but quiet. It is a real plus to be in town and have free parking. The room was fabulous!!!! The bed was comfy and the suite was light and tastefully decorated. The breakfast choices were broad. They made waffles, omelettes and hot beverages to order along with freshly baked muffins. But, the icing on the cake is Tina at Reception who is perfect for her job. She is welcoming and a top notch concierge, (with excellent recommendations, a love for the town and pleasing personality). She truly enjoyed making our stay outstanding. Charming casitas! Each ome unique. Ours very large with kitchenette, lovely bed, incredible yard with outdoor fireplace. The staff was very friendly and helpful. The delicious breakfast (omelets) included makes it a really good deal. 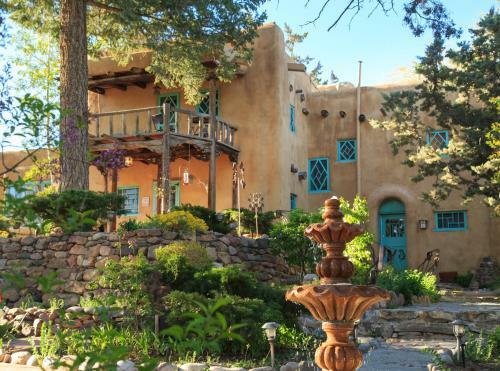 This Santa Fe bed and breakfast is a 10 minutes’ walk from the Santa Fe Farmers Market. Rooms are brightly colored, featuring Mexican inspired décor and seating areas. A full American breakfast is offered daily. Average score from 141 guest reviews: 9.2/10. The beauty offered for enjoyment in wvery room, and everything else. unbelievably cute and great place to stay! The staff was amazing as well!!! This historic inn is located just a few blocks from the plaza on a quiet street. It is very convenient to restaurants, museums and some of the historical sites. If you have a car there is a parking lot in the back. The "inn-keeper" was very friendly and informative, giving recommendations for restaurants and marking them on a map for us. Breakfasts were served in the dining room (or out on the patio in warm weather). They were delicious and imaginative, cooked fresh for each guest. Tea was served every afternoon with freshly baked cookies and pies. The inn has charming décor both in the guest rooms and communal spaces. My husband and I thoroughly enjoyed our two-night stay at El Paradero! This is a first-class B&B. Extremely friendly atmosphere - met several people also staying. We were shamefully pampered - amazing breakfasts, different every day; tea/desserts at 4:00; cookies at bedtime; coffee any time; lovely, clean rooms; living room w/ games; reading room w/ computer; patio; dog-friendly; advice, hints on stay; well located; can't say enough good. I'll be back! Sue is a wonderful host, very helpful and a joy to know. The B&B is beautiful and very well located. Beautiful property! The staff is very friendly and helpful! We were given fantastic suggestions for restaurants each day. It was convenient, quiet, very comfortable and the breakfast was terrific. Offering free Wi-Fi, this hotel is 10 minutes’ walk from Georgia O’Keefe Museum. All rooms are equipped with a satellite TV. A free continental breakfast is served to guests daily. Average score from 448 guest reviews: 9.1/10. We absolutely loved our room with balcony and fireplace! It was so cozy, yet spacious! Very clean and beautifully decorated! The guys running the front desk were amazing! I believe it was Paul who gave us all a fantastic history lesson while we ate breakfast! He was such a great speaker and it was so interesting! I can't remember the name of the guy who checked us in, but He was leaving that night for the pilgrimage to Chimayo. He told us He was very sorry He wouldn't be there the next morning! Everyone there was so friendly and helpful! Continental breakfast was very good too! This place is good for city holiday as well as for exploring the countryside. Staff was helpful and informative. Breakfast abd breakfast room were nice. Nava was an incredible host! He gave us the best recommendations for our 2 days in Santa Fe and let us even extend our checkout time when we wanted to come back after a hike to shower and change. The room was adorably decorated, super comfy, and location was just a half mile from the town plaza. We liked being off the beaten path, but close enough to the action. Would love to stay here again! The hosts, Victor and Doug, were wonderful. They took the time to give us the history of the city and the important sights to see. We only had three days but we feel like we experienced the best of Santa Fe's history. The breakfast was great with homemade bread. It is a family owner place and has a very friendly and helpful staff. Friendly staff. Very healthy breakfast. Comfortable, large room with a gas fireplace. Very romantic. Great location. Great non-traditional breakfast with good range of choice, i.e., not bacon and eggs, but good bagels, NM style fresh-baked corn muffins, chive and sour cream and salmon spreads. Also cereals, fresh bread, good juice and coffee, and a nice fruit and yoghurt assortment. The staff were attentive and friendly and shared local knowledge. The Guadalupe Inn is located in a quiet off-street area within walking distance of the plaza and restaurants and is a good value for Santa Fe. Everything about this place is great! Location, rate, room condition and cleanliness, breakfast, the owner Victor, the works. The rooms were nicely decorated, The heated floors were toasty warm, The breakfasts were an unexpected treat! Good location, close to many restaurants and shopping! Offering free Wi-Fi, this motel is 10 minutes’ walk from Georgia O’Keefe Museum. All rooms feature a flat-screen cable TV. An English breakfast is served to guests daily. Average score from 330 guest reviews: 9.1/10. Front desk staff were super friendly and gave great map talks. We loved our room it was clean bed was very comfortable and staff very nice. Clean , quaint, convenient & reasonable . Enjoyed our morning breakfast & visit with Christine. We enjoyed everything about our stay. Bed was super comfortable. We were on the 1st floor, which was requested since we have an old dog that can't do stairs. Room was clean and very Santa Fe. Location was walking distance to everywhere we wanted to go to. Overall, a perfect stay! Such nice folks! Loved the decor and hominess of the room. And the fire in the kiva was great on a snowy​ morning. This Inn feels like home. The bed was so comfy we were late for breakfast. They said no problem and then proceeded to fix us freshly cooked eggs. The service was amazing. Value for money, breakfast included, authentic decor. The breakfast was delicious. Location was within walking distance of the plaza and railroad and the staff were helpful, providing us with information on places to visit and sites to see and restaurants to dine at, and treated us like family. We enjoyed having breakfast by the fireplace each morning. The staff were great, the location is excellent, the room was comfortable and it's real value for money. 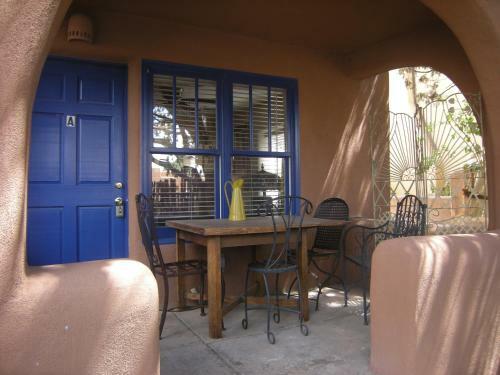 Serving a full breakfast daily, this bed and breakfast is located in the city centre of Santa Fe. All rooms are equipped with free Wi-Fi. Parking is provided for all guests on site. Average score from 57 guest reviews: 9.1/10. A perfect experience from the location to the room to the bed to the hospitality, ending with a delicious New Mexico breakfast. Next time I want to stay longer. The Inn on the Paseo is the type of lodging where I could easily spend a week. Looking forward to my next trip to Santa Fe! Oh, did I mention spotlessly clean! It was quiet, and secure. The home was cozy. Front sitting area was inviting. The tables and umbrellas on the West facing decks were very nice. We enjoyed our breakfasts at the Inn. Access to coffee, teas, fruits and treats is a very nice touch for visiting guests. Location is great. Lots of good literature to help with plans during a visit. The Staff was excellent. They were very friendly and helpful. The location allowed us to walk into town and see all the sights and eat at the restaurants and not deal with the parking issues in the center of town. 2 blocks from Santa Fe Plaza Fluffy soft pillows C.O Bigelow soap/lotion products Yummy cookies at night Free WiFi Our stay was magical! the staff were friendly and helpful. The location was excellent and the breakfast and homemade treats were tasty. It was a very neat and nice place for my trip. Its location being so close to the plaza was a big plus. Located in downtown Santa Fe, Inn of the Governors features rooms with free Wi-Fi and southwestern design. This inn features a full buffet breakfast each morning and free parking. Average score from 710 guest reviews: 9.1/10. The breakfast buffets were really good, with lots of selections, & service was very attentive. The Del Charro Restaurant & Bar was a good option for lunch or dinner & afternoon sherry & cookies was a welcome respite from shopping! The art culture is the best I have seen and is the 3rd largest art Centre in the United States. Staff was exception. We had assistance to park, help with bags, directions and assistance on selecting restaurants. We wanted to see performance and staff even remembered to give us info on that the next day. Decor was wonderful with fireplaces aglow. Hotel had remarkable location for all our explorations. Breakfast included in rate was not just pastry but full menu option. The facility was lovely . Breakfast excellent . I will miss the southwestern eggs. Loved the fireplaces.would book there again.enjoyed 4pm tea sherry time and being able to sit at pool . A truly wonderful experience. Cookies and sherry are a nice touch in the afternoon to make you feel like part of a community. The breakfast was absolutely delicious. ..and was included in the room rate. The staff was friendly and helpful. Complimentary brandy and sherry in the afternoon was nice. Professionalism and friendliness of staff , location, happy hour. The room was clean and charming for a facility built in the 60's and still retaining its old world atmosphere. Everything was bright and fresh even while having a somewhat cowboy/western attire. The beds were great and I loved having a real blanket across the foot of the bed, which gave sleeping an extra level of comfort. Best staff ever in this hotel. A perfect place to stay. I wouldn't change anything. I will definitely return. Outstanding service, clean, tidy, friendly staff, awesome food, drinks and interiors of the hotel, lobby and rooms! Breakfast was one of the best I ever had in the hotel in my life! Located just 1 block from the Historic Plaza and Convention Center, this Santa Fe hotel features designer suites with spa-style bathrooms. Free Wi-Fi and an HD cable TV with a Blu-ray player. Average score from 269 guest reviews: 9.0/10. Room with king size bed was spacious, clean, and beautifully decorated. Area was quiet and parking was underground and secure. Staff was very helpful! Perfect location for walking to restaurants and shopping. Great location. Nice accommodations. Healpul staff. Would definitely stay here again. Swanky little joint hidden just off of the main plaza. Super unique and cool, very helpful staff, great accommodations, comfy beds. Loved the two rooms for us and our kids- one room with a king bed and another with 2 twins. Delightful place to stay close to the plaza. Quiet and not crowded. Central position, pleasant and efficient staff, useful little cafe for breakfast and snacks. We loved the size of the hotel! The bed was extra comfy, the deco was cool! We had the hot tub all to ourselves, the location was great. We flew in early and they let us check in and held our bags so we could eat lunch after check out time and not worry about what to do about that. They were extremely friendly and helpful. We will stay there on all our visits to Santa Fe! The bed was amazing - not a typical cheap mattress at a nice hotel. The whole room felt so upscale cozy and had nice amenities. It was in a TERRIFIC location, too with convenient parking. HIGHLY RECOMMEND! The bed was not too hard. I like it really soft, husband likes really hard, it was a better bed than Extended Stay for the both of us.The rooms had coffee pot, ice bin, mini fridge and microwave. They also had cable, and plentype of body wash, shampoo and conditioner. Make up remover and make up mirror, Iron and ironing board...everything we needed. Is pet friendly and has nice restaraunt right next door (sushi). They also have bamboo surrounder hot tub on beautiful relaxing back patio. We would go again, for sure! Everything was very nice. Enjoy staying in boutique hotels. Location was excellent. Located less than 1 mile away from the Georgia O’Keeffe Museum, these apartments features a fully equipped kitchenette and free Wi-Fi. It offers a 24-hour reception. Average score from 9 guest reviews: 8.9/10. Situated on 5 acres of beautiful gardens, this Santa Fe hotel features an outdoor pool and individually decorated rooms equipped with satellite TV. The Georgia O’Keeffe Museum is 2.9 miles away. Average score from 317 guest reviews: 8.6/10. The hotel decor was beautiful and the room was comfortable. The breakfast buffet was great with fresh fruit, real eggs, fried potatoes real plates and silverware, and more. The staff was very nice and professional. This inn is very charming and relaxing. It has its own allure which I find very appealing. There is no breakfast on site, they give you a $5 coupon that is used at the Pantry diner just adjacent to the inn. This diner is OLD SCHOOL and has been there since 1948 and the food that I had was VERY-VERY good. If I was ever in Santa Fe again, I would go there to eat any meal they serve. The motel is lovely. The staff corrected a mistake made by booking.com in that we didn't get what I made the reservation for and that was a great help to me. Good location- lovely facilities and very pretty. We had a lovely stopover here. Everything. Hot tub was very nice and hot with outdoor fireplace. Staff are so nice and help in anyway they can. The ambiance of the el Rey is old Santa Fe. Very charming! Loved it here, our 2nd visit. Will keep coming back! I have never been a hotel, or at my own house, with such a comfortable bed and pillows! I was thinking of contacting them to find out the brand names of both! I would highly recommend this hotel! Super Comfortable beds and very clean. Love the the shady grounds. Nice hot tub. Great location. Easy access to down town. Loved the atmosphere of the inn and the room appointments. This boutique hotel in New Mexico is 100 yards from downtown Sante Fe. It features hand-crafted décor, walking tours and guest rooms with coffee facilities. 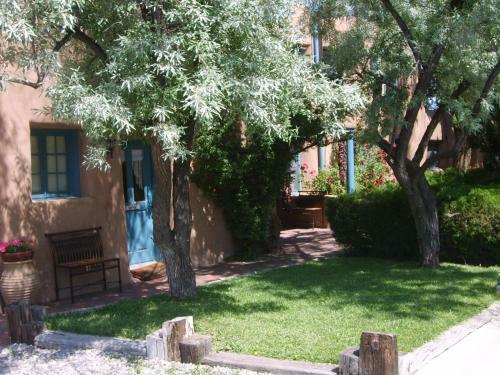 Free Wi-Fi is available in all rooms at the Hotel Chimayo de Santa Fe. Average score from 116 guest reviews: 8.5/10. Great location, convenient parking garage, fresh cofee in the morning and fruit in the afternoon, warm fire on chilly evenings. And did I mention great location? Old Santa Fe patina made our trip special. First off the location is perfect: less than 100 yards from the plaza, yet on a quiet street. Great for walking around Sante Fe! The staff is tremendous, very helpful and friendly! Ernesto and Ruben are great! The hotel itself is SO pretty! The chili ristras. Hanging everywhere are SO cool! The rooms are beautiful. We got one with a Kiva fireplace and Ernesto started a fire for us using piñon logs. We still savor that smell and evening. We were there for 3 nights and wished it were more. Hated to leave. Can't wait to go back! We really enjoyed our stay. The location was great and staff was super friendly. The deco was just what you would want from a stay in Santa Fe. This is not your typical cookie cutter hotel room! We will stay here again. Very nice hotel in an excellent location. Check in was speedy and the staff were very friendly. Comfortable room, clean and quiet. Location was perfect. Hardly had to use car. Beds are very comfortable and loved the outside little bistro tables. This was my 3rd visit to Chimayo. The location is absolutely perfect for enjoying the plaza, Canyon Rd and surrounding area. The staff is super friendly and helpful and the rooms are spacious and clean. Very comfy bed and pillows!! We were quite impressed with the room. Easy access, two rooms, two televisions, bed was wonderful with seven pillows, coffee pot, fridge, and all very "Santa Fe". Walk out the front door and you're about 75 ft from the Plaza area. Super comfy bed, fun bar and happy hour. Perfect location. Very close to the Plaza and the Cathedral. A welcoming Receptionist. I love my room. Featuring the full-service Nidah Spa, this New Mexico hotel is a 6-minute walk from the historic Santa Fe Plaza. On-site dining, a rooftop heated pool and Southwestern-styled rooms are provided. Average score from 130 guest reviews: 8.5/10. Large beautiful room in a gorgeous hotel. GREAT staff, warm, welcoming and helpful. Staff were excellent. When we asked for more light they brought in 4 more lamps. The hotel is blocks off the plaza and feels very luxurious. The price was very reasonable. We hope to stay there again. Close proximity to the Plaza. Friendly and helpful staff. I have stayed in many hotels in Santa Fe through the years including the Eldorado. The location is premier for downtown shopping & restaurants. The hotel as been completely renovated is very classy & special. I will stay there again. Great hotel. Best spa ever. Will certainly return!! We discovered the Eldorado last Oct. by way of a Spa appt. We have a time share nearby and walked over. That was such a great experience , we planned 3 extra days onto our anniversary time share week to return to the Spa experience. All staff is beautifully trained, enjoyed Jodi and Salvador's service in Agave, John served us so kindly. Great place to stay in Santa Fe, walk to everything. Excellent location, great margaritas in the lounge. Staff was superb--friendly, helpful and all those others words that say great customer service. Loved the location and attention to guests. Felt like everything was within easy walking distance from hotel. Guest rooms at this Santa Fe, New Mexico hotel are bright and spacious. A gym and free Wi-Fi are available at the hotel and Lensic Theater is 200 yards away. 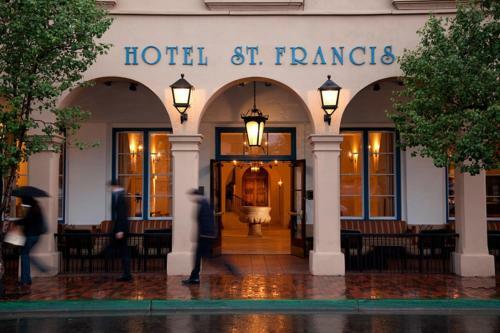 In-room massages are available at the Hotel St. Francis. Average score from 317 guest reviews: 8.2/10. Andrew at the front desk was very helpful and courteous. He recommended various restaurants to go to in the area. Great place to stay in Santa Fe. Friendly courteous helpful stafff. Great atmosphere and facilities. The food at the restaurant was terrific and the hotel bar was a cool, laid back hangout. We would highly recommend staying here. We liked the simplicity of the hotel's design, as if we were staying at a mission or monastery, but with all the comfort one needs..The Heritage company did it well! Love the location, beautiful, great staff, clean, great bed, slept so well. Love your hotel ! Location, Location, Location . . . and the staff was extremely accommodating! The vibe of the hotel is great. Attractive and interesting décor. Not fancy, but attractive and interesting. The bed was my favorite thing. Large, fluffy, and the stack of pillows on it allowed me to just sink in and go to sleep. The rooms were clean, staff was really friendly and informative. It was right next to everything, so I could walk everywhere. We're here in 2012 and knew we would return. Love that you are dog friendly. Not religious but LOVE the decor! El Secreto is my favorite bar(Chris is really great). Love that the locals hang out in the lobby and bar on the weekend. We will be back again! This was a great hotel. The location was excellent the staff was very helpful. The building itself was really beautiful. This Santa Fe hotel offers free airport transfer service and features both an indoor and outdoor pool. All guest rooms features a terrace and a flat-screen cable TV. Room service is available. Average score from 68 guest reviews: 8.1/10. Awesome beds! Great room service! Friendly professional staff. Clean friendly, nice room. Conveniently located for our needs. Would definitely stay here again! the hotel rooms were very comfortable,and the hot tub was very relaxing. Amenities, comfort and cleanliness of the room, fantastic staff (especially Michael and Clarence, from the evening shift) who were extremely helpful and friendly. Great that there was a bar on the property. We liked being close to many of the interesting attractions. The room was equipped with some ADA aids. The beds were comfortable and the bedding was very clean and crisp. Towels, etc., brought expediently. Staff very friendly. Staff was excellent. The manager named Michael helped us with an issue regarding our booking and went out of his way to accommodate us. Made us feel very welcomed. Would definitely stay in the future. Linda at front desk is a tremendous asset. Her smile and effecientcy was a pleasure after a long day for my wife and myself. Nothing extraordinary, except for the staff, but well done and good attention to detail. Located less than 1 mile from Georgia O'Keefe Museum and historic Santa Fe sites, this B&B offers individually decorated rooms with free Wi-Fi. It serves a buffet-style breakfast every morning. Average score from 36 guest reviews: 9.7/10. Private casitas, fireplace, room and decorating, breakfast room and breakfast, location, oh and did I say fireplace? Staff was awesome? They acommidated my food allergies needs by providing a wide selection of tasty gluten free tasty. The location to local activities was in an easy walkable distance. The wood burn fireplace in the room was a pleasure to have. Very upscale accomidations! The suite that we stayed in was right on the road next to the part of the inn where breakfast was served. Wayne is a lovely, charming host who knows a lot about art and the Santa Fe community. The breakfast each morning was worth waking up for. All kinds of delicious options provided plenty of fuel to last until dinner. Cool skylights in each area of the room. Well decorated with its own gated porch.. Drive right up to your room to unload and load your car. Tasty healthy breakfast. Personable,caring, happy staff. Lovely landscaping. Homey accommodations. Loved the fireplace. The whole place was beautiful and so comfortable. Nice parking area. Some separate accommodations. Scrumptious breakfast and amazing staff. They went out of their way to get us a baby crib when we showed up and another guest was using the one they had. So nice!!! Such a comfortable bed, and heavenly sheets. We loved the fireplace in the room! Everything was perfect and the staff was lovely. Great inn owner who really knows the area. Perfect suggestions for all kinds of activities and restaurants. Coziest bed ever. Thank you Wayne! Owner Wayne was delightful and informative. Nice fire place in room . Location was perfect for seeing Santa Fe! Situated in the heart of Santa Fe’s historic district, this resort offers on-site dining and spa services. A fireplace and free Wi-Fi are included in each vibrant room. Historic Plaza is 2 blocks away. Average score from 27 guest reviews: 9.7/10. Bathroom in the Lapis suite is jaw-dropping beautiful. Staff's professionalism and friendliness was . Fantastic breakfast. Décor was great, kiva fireplace and wood was really fun, breakfast was terrific. Really appreciated the upgrade for our anniversary too. The suite is practically a work of art with so many rich elaborate decorative touches in so many media - silk tapestry, intricate mosaic, upholstery both Asian and Navajo. The Refrigerator is restocked daily, treats left daily, a sumptuous breakfast included. Seems like a labor of love as much as one of commerce- even though it's obviously plenty expensive. Staff was friendly and helpful. Very romantic setting. Everything and everyone was great, and we felt pampered throughout our stay. Truly a treasure. Fabulous one bedroom suite; extremely cozy and comfortable. Great for romantic getaway. Superior breakfast. Very convenient walking to all of downtown, the rail yard and lots of art galleries. The most comfortable bed ever! Amazing staff! Perfect location! Best Hotel in Santa Fe. Worth every penny. They know the meaning of service. Lovely and charming property. Best bed we have had in a hotel, The staff was so nice and helpful. Breakfast was great and we were given plenty of time to relax. Situated in the heart of Santa Fe, just 10 minutes’ walk to The Historic Plaza, this Santa Fe B&B provides a fresh gourmet breakfast. Bathrobes are provided for all guests. Average score from 49 guest reviews: 9.6/10. Accommodations were great....attention to detail exceeded expectations; with high end decorating, turkish towels, and radiant flooring in the rooms. The food was excellent....the made to order omlettes were the the best we've ever had; and the warm and friendly customer service made you feel right at home. Great location for walking to the Plaza for museums, galleries, and dining; Canyon Road nearby too. Gracious lodging with attention to every detail. We were the only guests during our stay and had an early departure the next morning. We were provided an earlier than usual breakfast of scrambled eggs with hatch chilies and cheese, which was amazing. We didn't have time to eat the fresh fruit so they packed it up for us to take on the road which was much appreciated! We loved the location in that we could walk to shop and dine! The entire staff was wonderful! Many thanks! Very friendly. Wanted to help and make your stay the best. We arrived early and just wanted to park our car and walk the area. We were allowed to check in and upgraded to a nicer room immediately. We were very pleased. The bed was soooooo comfortable. They really had thought out every little detail to make us comfortable. I loved the little kitchen where I could sit and drink tea and eat cookies and read, listen to relaxing music and crochet! Very clean!The place was perfect! It was conveniently located within walking distance to restaurants, shopping and historical sites. The room and property were comfortable, nicely decorated and well taken care of. Really appreciated the quality of the rooms and the overall friendliness of the staff. 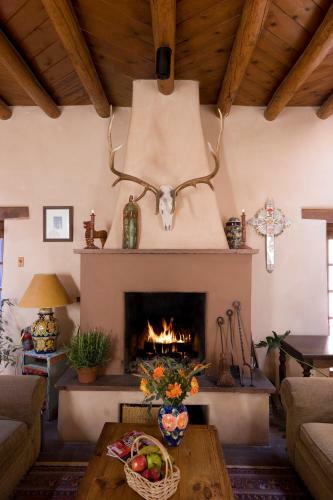 Next time we are in Santa Fe, we will stay at the Four Kachinas again. Excellent! Featuring free WiFi, a hot tub and a sun terrace, Casa Cuma Bed & Breakfast offers accommodation in Santa Fe. Some rooms have a seating area where you can relax. A balcony or patio are featured in certain rooms. Average score from 8 guest reviews: 9.6/10. Offering 3 restaurants on site, this hotel is located in Santa Fe. All rooms feature a kiva fireplace and free WiFi. Santa Fe Plaza is 180 metres from the property. Average score from 157 guest reviews: 9.6/10. Lovely, brand new hotel right in the middle of town. The staff are all very polite and always offering to help. The rooms were perfect - ours had a little fireplace that we used in the evening. There was a personalised, handwritten note waiting for us in the room welcoming us to the hotel, and turn-down service in the evening. All-in-all it was a really lovely stay - I wish we could have stayed longer! Reception outside hotel by staff who took my car keys and valet parked. Mario took my cases and hung my jacket in room. Ice bucket filled every Pm. Bar was very friendly. Great staff. Perfect location, just off the central plaza. easy walking to many sights. Gorgeous room, we let them know ahead of time that we were bringing our dog and they actually set up a little doggy area in our room with two bowls! The bed was so comfortable, the humidifier a plus. The best part was the staff, they always took great care of us. Amazing staff. Richard gave excellent advice about touring and restaurants. The hotel is beautifully designed and furnished. It looks like something out of Architectural Digest. It is also small and intimate with a very polished and friendly staff. Loved having the firplace turned on and homemade cookies left out every night as part of tun-down service. The staff was excellent and very helpful in every manner. The turndown service was a very nice touch and included the addition of a humidifier to battle the arid climate. The fireplace made the room cozy and the bedding was comfortable and difficult to leave. The central location was perfect and we were able to walk to all attractions. While the location and high end furnishings/bathroom are excellent, the quality,efficiency and genuine warmth of the staff starting with Front desk manager (Peter)' front desk staff,bellmen and housekeeping are what made our stay exceptional! Great amenities, bed and linens. Double sink in Bathroom with plenty of room for your things on the counter. Location was on the famous Santa Fe Plaza. Staff was amazing! Facility was spotless and luxurious! Excellent hotel all round. Central location, elegant rooms and decor. Gas effect real fire in the room. Also humidifier and super comfortable bed. Polite and attentive staff - particularly at reception. Good room cleaning. Tasty restaurant. Warm welcome when we arrived late (1am). Nice touches. 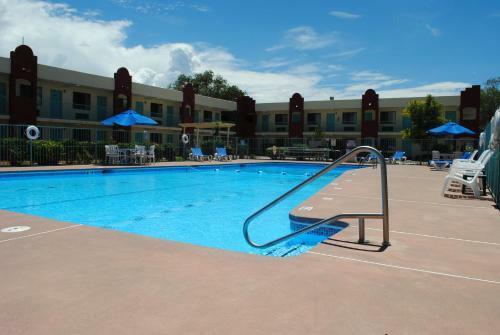 Offering a seasonal outdoor pool and free hot food and cold drinks, this hotel is located in Santa Fe. All rooms feature WiFi and a flat-screen cable TV. Santa Fe Plaza is 400 metres from the hotel. Average score from 546 guest reviews: 9.5/10. everything is good, location, staff, and breakfast, everything, worth of the price! Big, clean rooms. Large bathroom with shower and soaking tub. Fantastic, knowledgeable staff. Evening kickback included 3 drinks and hearty apps for free! Breakfast included. Amazing art throughout the hotel. Rooftop bar to view sunsets. Right on the plaza to see all the sights. Many great restaurants within walking distance. Value for the money over the top! The staff was extremely helpful with directions and providing excellent choices for eating. All staff was so nice! Happy hour drinks and food were fantastic and breakfast too! Loved our stay! Absolutely everything--room, location, happy hour--everything! Buffet breakfast and happy hour appetizers were all complimentary, with an wide selection of hot and cold foods. Service was amazing everywhere from the time we checked in until checkout. Excellent value. 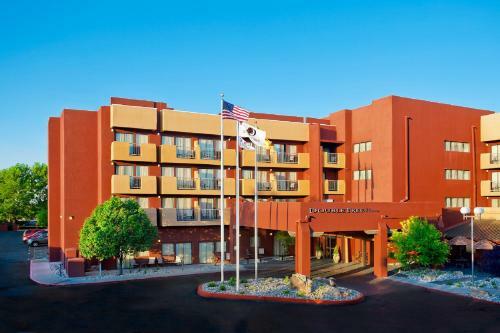 Located in the heart of Santa Fe, this hotel is 5 minutes’ walk from the Canyon Road art galleries. Free Wi-Fi is featured in all warmly decorated rooms. St. Francis Cathedral Basilica is 7 minutes’ walk away. Average score from 216 guest reviews: 9.3/10. Well located, nice, clean facilty with friendly staff and good breakfast. Our room was very nice. Everything was fresh and clean. The bed was really comfortable. The staff was very helpful with information and sightseeing ideas. We appreciated the courtesy car that took us to dinner and picked us up after dinner. Overall, a wonderful stay. Incredibly charming hotel in a fantastic location. Our dinner in the hotel restaurant was first-rate, as was the outstanding free breakfast in the morning. No watery coffee and stale bagels here - homemade and delicious. Our room was immaculate and comfortable. This is the 2nd time we have stayed at the Inn of the Alameda. Check in and check out was a breeze, great breakfast, and awesome location. Quiet, peaceful place to stay. The room was perfectly decorated. It was so comfortable we didn't want to leave to go out for the evening! The staff was friendly, sincere and accommodating! We have been guests at the hotel during the past 29 years. The accommodations, staff, and location are outstanding. Very few businesses are able to maintain consistent quality over such a long period of time. The staff were always friendly, helpful and professional. The shuttle service was a huge bonus and the drivers were always prompt. The rooms were adequate size and the beds were very comfortable. Breakfast was not your typical hotel fare, but was a step above with a wide variety of healthy options. Staff was helpful and polite during our stay. Rooms were lovely, clean and comfortable. The Inn called ahead to let us know we'd be staying on the second floor which had no elevator. That was no problem but we appreciated the heads up. Breakfast was first class. Also location couldn't be better. We will be back! The centrally located La Fonda on the Plaza, with Santa Fe mountain views, features an outdoor pool, rooftop hot tub and spa. Guest rooms offer flat-screen cable TVs and free Wi-Fi. Rooms provide desks, safety deposit boxes and ironing facilities. Average score from 457 guest reviews: 9.3/10. The staff is outstanding! Love the overall style, decor of the property, especially the artwork that is tastefully displayed throughout the property. Great location. The food at the restaurant on the property is great as well. The staff was very friendly! They went overboard to assist you. A fabulous luxury stay. The location was excellent, right in the heart of Santa Fe. The building is gorgeous. The staff are friendly and helpful. The food was delicious . La Fonda is our absolute fave. We come 2-3 times a year! Fantastic hotel with a rich history that has been lovingly restored. Super-comfortable and family-friendly with well-appointed rooms with local art Work. Excellent restaurant both in terms of food, drinks and setting. Would highly recommend - not least because of the good location in the middle of town! The hotel is beautiful appointed. It's like walking around a museum or someone's fine home. There was even artistic tiling in our shower! And the restaurant was surprisingly good quality and value -- unusual for a hotel restaurant. Bed and bedding were perfect. Can't beat the location for a Santa Fe visit. I've been to Santa Fe many, many times and have stayed in most of the downtown hotels throughout the years. This was, by far, my best experience. La Fonda has an excellent location and their customer service was well beyond my expectations. From the moment I arrived, they treated me like no other I can recall visiting. There was a slight mix-up on my reservation and they more than lived up to their reputation by taking care of the mix-up (which was not even their doing). My room was perfect. There were absolutely no flaws. I will stay at this hotel in my future visits - without a doubt. Offering a garden, Casa de Tres Lunas/House of Three Moons is situated in Santa Fe. The Plaza is 500 metres away. Free WiFi is featured throughout the property and private parking is available on site. Average score from 86 guest reviews: 9.2/10. Excellent location and very nice accommodations. Loved it and would love to go back. Loved my stay here. Felt like I was coming home at night instead of just another hotel room. The location is excellent, the room was very clean and the bed was comfortable. There were complimentary snacks and drinks in the room when I arrived. I will definitely stay again. Loved the private courtyard seating areas. The unit was well equipped and while older well maintained. The staff was extremely attentive. We were very happy to have found this charming boutique hotel. Wonderful location a few blocks from main plaza. Staff was very friendly and helpful. I've stayed in many hotels in Santa Fe. I vote this hotel best value for plaza area hotels. Will visit again, no question. The unit was well equipped and comfortable. It was a short walk to the plaza, restaurants, etc. Our host, Matthew, was pleasant and very responsive to our needs. The kitchen was stocked with a few snacks when we arrived, and we picked up some additional breakfast and snack items at Whole Foods. This "casa" was much more comfortable and "homey" than a hotel. Also, free HBO & WiFi!! Charming suite, fabulously comfortable bed,delicious snacks! room very cozy and comfortable. complimentary snacks and drinks were a nice surprise. market and shops walking distance. restaurants and cafe shops close. very pleasant. Very nice room and location was a walk to any where, restaurants, art galleries, town square, all right there with a short walk. comfortable and stylish, well thought out layout, free parking for those with cars who want to get to hikes and day trips like Ghost Ranch and Taos, yet also walking distance to museums, galleries, and shops in the East side and Plaza area. Located on an acre of landscaped grounds, this Santa Fe, New Mexico property is within 15 minutes’ walk of Santa Fe Plaza, Chapel of San Miguel and Linda Durham Contemporary Art. Complimentary Wi-Fi is available in rooms. Average score from 24 guest reviews: 9.1/10. Great breakfast, welcoming host/owner, beautiful property and rooms, wish we could have stayed longer! Breakfast , cookies, genuine sincerity of staff, maintenance of property, serenity of setting. Everything was great...breakfast was amazing and they were very kind to cater to a gluten allergy. Highly recommended! 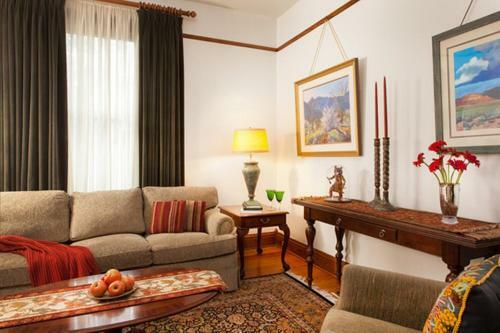 Charming inn within short walking distance to the plaza, art galleries, restaurants, and more. Comfortable rooms, great food, and friendly owners/staff. Definitely a great place to stay! Great breakfast. Comfortable room and bed. Friendly, helpful staff. The bed was very comfortable. It was lovely and quiet. The owners were really helpful nothing was too much trouble. Breakfast was fabulous. beautifully furnished house. Our master bedroom was huge. The atmosphere was less a hotel, and more that we were guests in a house. Superb gourmet breakfasts! Ideal location, just 10 minutes strolling distance from the city centre. Beautiful location comfy and clean . host Dan was v friendly and helpful at all times. 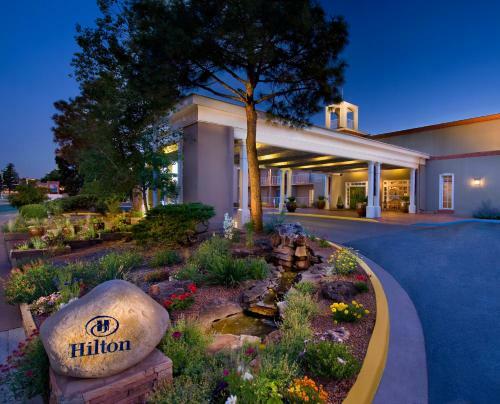 Residence Inn Santa Fe is located 1.5 miles from the Downtown Plaza and Canyon Road Gallery District. It offers a heated outdoor pool and a whirlpool, along with free Wi-Fi. All hotel suites come with luxury bedding and sofa sleepers. Average score from 15 guest reviews: 9.0/10. My family and I had a great time at the Residence Inn. We like the amount of activities for the children and the staff was very friendly. We liked the location of our room (second floor on outside perimeter of property). It was prety quiet and had a pretty view. I loved seeing the trees as we exited our door. We liked the room; it had everything we needed to make this stay very comfortable. Our son attends the University of Art and Design, and we were able to have him and a couple of his friends over for breakfast and there was enough space for all of us. Oh, the breakfast you served on the other mornings was very good insofar as selection, appearance and taste. the pool and hot tub were great, but the room was beyond our expectations.. The customer service given by the front desk clerk was great! Everything. From check in to check out it was a great experience. 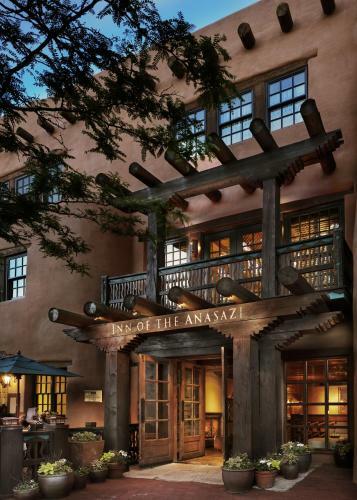 Offering spacious accommodations along with cultural activities, this Native American-owned hotel is situated in Santa Fe's Railyard District and features exceptional on-site spa services and gourmet dining options. Average score from 191 guest reviews: 8.9/10. Beautiful room with the most comfortable bed and pillows. Great shower with plenty of hot water. Nice bar to have a nightcap. Great place to stay at a great price. We met Nat in the lobby for coffee and history lessons about Santa Fe. Great perk! Will stay here again when in Santa Fe. Comfortable beds and lovely property. Loved the unlimited free shuttle to downtown. Staff was friendly and kind and tried hard to please. Bar food and on-site restaurant food was excellent. atmosphere, service, staff, restaurant, bar, room, location, soft music, culture, everything! Loved this hotel! The location was very convenient to the downtown plaza area and art museums. Hotel offered a shuttle service so we didn't have to worry about finding parking downtown. Staff was very accommodating. The food was fantastic and the nice relaxed atmosphere. I loves seeing all the pets, we had no idea it was a pet friendly hotel. Spa was wonderful and the Amaya restaurant had great service and great food. Shuttle service was extremely good! This hotel is one block of the Historic Santa Fe Plaza shopping and entertainment area. The hotel offers an outdoor swimming pool, free Wi-Fi and a restaurant. Average score from 131 guest reviews: 8.9/10. I anticipated this hotel (my friends selected it) would have a chain feel to it, but was delight to find out was charming and comfortable with a feel of luxury. Very good location. Definitely a good value. The staff was excellent, friendly. Everything was absolutely clean and orderly. It almost feels silly to say my favorite part was the bed, but I'm pretty sure it was the most comfortable hotel. Ed I've ever encountered. It gave my mattress at home a run for its money. The pool, Hot tub, Fireplaces!!!!! Decor was very nice. All staff was courteous. fantastic breakfast to start our day of walking and touring. Loved the location too. The location to the Plaza was great. So convenient to get to every part of town we were interested in seeing, on foot. Seth was great and always had a smile. In fact, all of the staff seemed happy to help you. We had dinner in the restaurant, the food was terrific, the staff very attentive. We had a great experience. Very helpful staff, comfortable beds, great pool and hot tub, convenient to the central plaza, stores, restaurants, museums. It was a beautiful hotel . It felt like we were in a botique hotel but without the expensive price . The location was great. We just loved it!!! It was just a super nice hotel in a fabulous location. I have a dog, and there was a park directly across the street which made walking him in the a.m. and p.m. very handy. Offering charming southwestern-style accommodations, this apartment-style hotel is only moments from historic Santa Fe's most popular attractions and provides guests with all of the comforts of home. Average score from 381 guest reviews: 8.5/10. Roomy, clean, great showers, well supplied. Close to downtown plaza, the walk up and down the hill was great exercise. Short driving distance to grocery stores, gas stations, highway. It was a lovely place for a 50th anniversary family party. Four small families in their own apartments, visiting my Santa Fe sister. Swimming pool is 3 feet at each end, 5 in the middle and the kids adored it. It was great having own kitchens, and restaurants rather near. Perfect viewing of El Zozobra from our parking lot. I enjoyed the spacious and comfortable room, as well as how close we were located to the plaza and shopping, we could walk to where we wanted to go. Lovely, spacious apartment! Did not expect all the room & wonderful southwestern feel. My husband and I loved the spaciousness of and view from our unit. Everything was perfect. The staff extremely helpful. Definitely would go there again. Our spacious two-bedroom apartment was extremely comfortable and beautifully decorated. There were three of us -- myself, husband and friend. There is a free shuttle to downtown Santa Fe during the day -- that's a real plus. To return after dinner we did Uber. About a 20 minute easy downhill walk to central Santa Fe's sights and restaurants. Very helpful staff. Help with luggage if stairs are a problem, I suggest requesting a 1st floor unit. A terrific bargain in pricey Santa Fe. It was quiet and serene. The location is close to downtown but far enough away, you really feel one with nature. Beautiful property and my suite, #90, was simply perfect! Featuring an outdoor swimming pool, a spa and 4 restaurants, this Santa Fe, New Mexico resort is within less than 10 minutes’ walk of Santa Fe Plaza and art galleries on Canyon Road. Average score from 88 guest reviews: 8.3/10. Truly enjoyed the staff...from the valet to the young lady at the spa facilities. We had some appetizers ans amazing drinks in the main bar and the staff was such a delight, making the stay much more enjoyable!!! Great location, ultimate southwestern architecture and ambiance. Food, service, property all outstanding. Location is superb for walking the City. Valet greeted us n remembered our names, we left the room for a couple hours and when we came back our bed was done, we had new water bottles and everything was in order! Our room was wonderful and the food in the restaurant was excellent. A very courteous and helpful staff. Valet parking was handled well with repeated trips in and out of the hotel. We had a king room in a quiet corner with a fireplace- and they delivered firewood for free! We had the most relaxing, wonderful overnight stay. They had a lot of amenities we didn't have a chance to use in our short stay - We can't wait to go back! 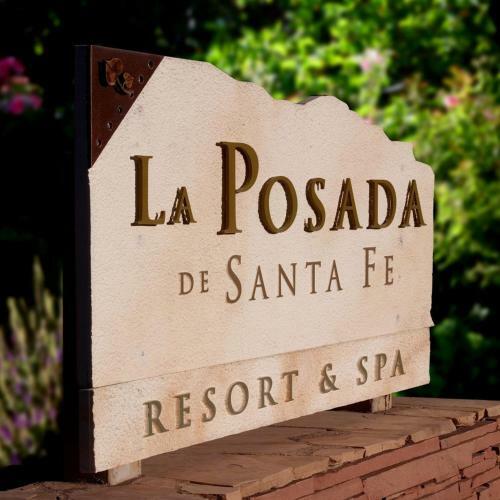 Kenth and Laura were married at The La Posada, so has always been their favorite, so beautiful, well kept up, great staff, food, drink, rooms gorgeous and very comfortable, love the pool and hot tub. Our favorite Staff Person Is David Stone...he made our wedding perfect and every time we are visiting whether for drinks, dinner or stay he remembers us and always takes time to visit. Best vacation ever!! Staff found and mailed my credit card back that I left at poolside! A thousand thank you's!!! The location is superb and the ambiance typical Santa Fe. The entire atmosphere was excellent. The staff was super nice. The location was great. At the end of the historic Santa Fe Trail amid the enchanted vistas of the Sangre de Cristo Mountains rests the Inn and Spa at Loretto–a modern Santa Fe lodging infused with the art and soul of the Southwest. Average score from 112 guest reviews: 8.3/10. Room well appointed, roomy, both the room and bed were very comfortable! Enjoyed the complimentary coffee early in morning and it was very good coffee. The staff at the desk and Parking staff were extending, kind and helpful! The rooms were great. The food at Luminarias was delicious! Perfect place to stay in Santa Fe! Great location, within walking distance to shops, restaurants etc. It was nice to not have to drive. The exquisite quality of every aspect of the facility, (from cleanliness to the high quality of bed linens; from heated bathroom floors to loveliness of the property). Beds were fabulous! Staff was friendly. Location was convenient. The setting was great. Located very close to downtown Sante Fe. Fabulous location! Morning coffee! Nice pool and spa. Was a great way to wrap up our 2 1/2 week American Roadtrip. Once we had the room situation straightened out things were great. The staff in the spa was wonderful very attentive to the individual needs of my wife and me. 5 stars for the hot stone message! 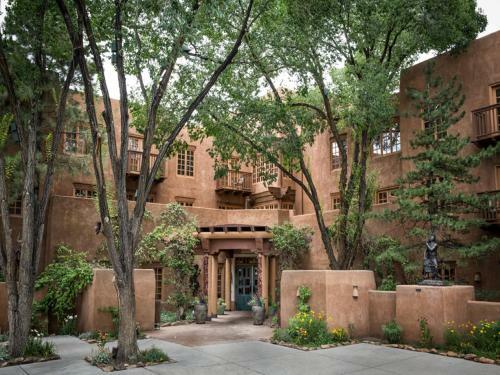 An enormous number of Santa Fe structures are on the National Register of Historic Places. Among these are several traditional style churches, most of them open for visits during daylight hours when no church services are in progress. Santa Fe is an important center for music and musical groups, the most illustrious of which is the Santa Fe Opera. Santa Fe has a variety of interesting museums, most in the downtown area and easily reached on foot.